This is now the fifteenth Grand Prix at the Sakhir Circuit in Bahrain, becoming the first world championship race to be held in the Middle East in 2004. Sparks will fly in more ways than one, as this track throws up plenty of overtaking opportunities, and it also become Formula 1’s second night race ten years after its debut, visually amplifying the battles. The inaugural Grand Prix was won by eventual seven-time world champion Michael Schumacher from his Ferrari team-mate Rubens Barrichello and Jenson Button in his BAR. In 2005, the new forthcoming champion Fernando Alonso took the spoils. Schumacher had run off the track in his chase of the Renault driver and soon retired with a hydraulic problem, bringing his run of 58 races without a mechanical retirement to an end. Race day also brought the hottest conditions yet seen at a Grand Prix, with 41.9 degree and 56 degree air and track temperatures. Alonso again had the measure of Schumacher the following year, overturning Schumacher's lead during the pitstops. Bahrain hosted the season's curtain raiser this time, the first race for both the 2.4-litre V8s and for the Q1, Q2 and Q3 qualifying system. Perhaps most memorably, Kimi Räikkönen* came a cropper in Q1 with a rear wishbone failure, failing to set a time, and charging through in the race to 3rd on a one-stop strategy. Felipe Massa won in his Ferrari in 2007, with Lewis Hamilton 2nd in the McLaren and Kimi Räikkönen 3rd for the third successive season, this time in a Ferrari. Alonso, Räikkönen and Hamilton all left the race equal on points after three Grands Prix. Hamilton also became the first person to ever take a podium in his first three F1 races. Massa won again in 2008 from Räikkönen, with polesitter Robert Kubica completing the podium for BMW-Sauber. Hamilton drove into the back of Alonso and ended up a lap down. In 2009, Toyotas locked out the front row of the grid for the first time, with Jarno Trulli on pole and Timo Glock second. Glock took the lead at the first corner, but it was Jenson Button who won for Brawn from fourth on the grid. In 2010, Bahrain had the season opener for the second time and Alonso led home a Ferrari 1-2, where for one occasion only as it turned out, the Grand Prix used a longer 6.299 km layout. By taking victory, Alonso became the seventh and most recent driver to win on his debut for the Prancing Horse. In 2011, a month before the*Grand*Prix*was due to be held, it was cancelled following the Bahraini protests, returning the following season and seeing the first of two successive Sebastian Vettel and Red Bull victories (and two identical podia – with Kimi Räikkönen and Romain Grosjean second and third for Lotus both times), before Lewis Hamilton and Mercedes took two in a row in 2014 and 2015. In the first of those two years, there was a particularly thrilling duel between team-mates Hamilton and Rosberg, with some hard and close racing, and Pastor Maldonado also tipped Esteban Gutiérrez into a roll. In 2016, the fairly unanimously unpopular qualifying format which saw a car eliminated every 90 seconds was used for the second and last time. Rosberg won, and there was a first corner collision between Valtteri Bottas, Hamilton and Daniel Ricciardo, while Sebastian Vettel didn't even make the grid, thanks to an engine failure. Hamilton managed to get back to third. The following year, Bottas took pole early in his Mercedes career, but Vettel won in the Ferrari from Hamilton and his team-mate. Last year, Max Verstappen, making his way up from 15th on the grid, tangled with Lewis Hamilton, who had fallen to 10th, puncturing his left rear. Kimi Räikkönen collided with Ferrari crew member Francesco Cigarini, breaking his tibia and fibula, after his team's pit light changed to green early. Bottas harried leader Vettel, but didn't make it past. They finished like that, with Hamilton in third. Pierre Gasly claimed his first points and Honda's best finish since their return, with an excellent 4th place. 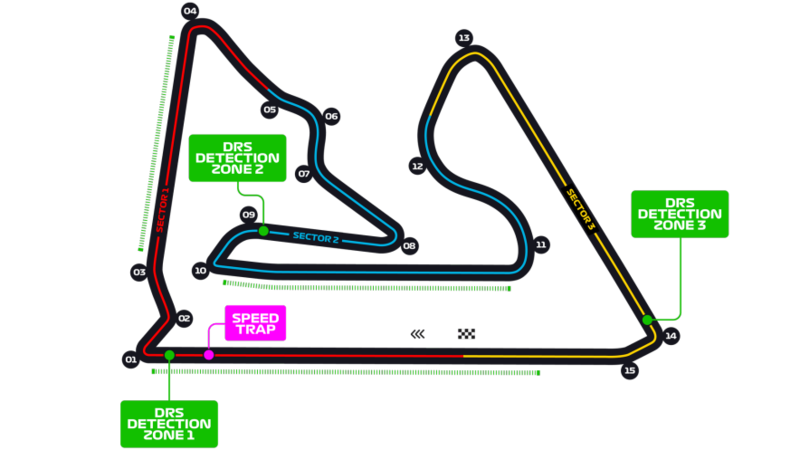 This year, the Sakhir circuit sees the addition of a third DRS zone. After the start-finish straight and DRS Detection Zone 1, Turn 1 is a right-hand hairpin, while the gentle left-hand 2 feeds into a small right-hander which just takes drivers onto the next straight (with DRS activation). Turn 4 is a slightly off-camber right, while the 5, 6 and 7 left-right-left challenges the downforce. Turn 8 is another right-hand hairpin. DRS detection can be attained at the end of the next straight, just before the tricky Turns 9 and 10. Drivers go left through 9 and have to brake while turning, making it easy to lock up the unloaded tyre. 10 is a tighter left. The next straight can see DRS activation, before increased gradient and a change in style for the remainder of the lap. There is a long left-hander in 11, before the flat-out right at 12. 13 is a tighter right and the start of Sector 3. DRS Detection Zone 3 is at the end of the next straight and the lap ends with the 90-degree right of 14 and its extension at the end of 15. The DRS activation will be on the next straight. What are your biggest Bahraini memories? Robert Kubica's pole in 2008 was the only pole of his career so far, and the only one for Sauber in any of its guises. Kimi Räikkönen has taken eight podium positions in Bahrain without winning. I think last year's race was excellent, maybe the best one on this track yet. The tires seemed to finally do what they were always promised to do: provide multiple viable strategies and give teams more options. Bottas didn't end up close enough to make a move but the finish was nailbiting. Hoping for more of the same this year! last year was Kimi's pitlane accident and SV forced into an extra long stint at the end? i think that was last year...if so then yes a very good race! very good intro BR. thanks! have been reading about some protests/protesters using the GP to question the legitimacy of the local gov't. opinions about mixing sports and politics is a difficult topic to say the least...certainly i have my opinions but rather than sharing them i will just say this locale is less than ideal imo. P2 and still a Ferrari 1-2, but Vettel back on top. Thanks for the great intro BR. Another crackin intro BR, thank you. Looking forward to this race. I suppose the big question is, can Ferrari turn it around after Melbourne. It's still early days but a good result will be a morale booster. They don't want to finish the first two rounds on the back foot. The other question is, can Valery beat Lulu again? Thanks. Glad people enjoyed it. There's not as much Bahrain Grand Prix history to comment on, so it gives me an easier time. I can see a weather report for a 62% chance of rain in Bahrain for qualifying. For some reason, I'm excited about that like a kid is about snow at Christmas. P3 over and it is still Ferrari 0.7 secs clear . Leclerc fastest again. Nico Rosberg suggested that Mercedes are holding back on using full engine mode capacity. Qualifying highlights C4 7pm. Will miss race tomorrow eve, unfortunately! Great pole by Leclerc! Let's see what Mercedes can do in the race.